For thousands of years men believed that the Moon was so remote that it was inaccessible. When someone was told that she was in the moon, they meant that she was dreaming or thinking about an imaginary country. But in the 1960s, the Russians and the Americans almost waged war and wanted to show their strength in the eyes of the world. They then decided to embark on the conquest of the Moon. It was actually an excuse for them to build very powerful rockets and engines that could eventually be used by the military. The two superpowers therefore had no other interest in going there; the Russians and the Americans only wanted to get there first for prestige! In the early 1960s, the Russians were ahead of the American program because they were very familiar with robot technology and had invested a lot of money in this technology. The probe Luna 1 approached the Moon at 6500 km distance in 1959 and in 1966 the probe Luna 9 settled smoothly on the Moon. 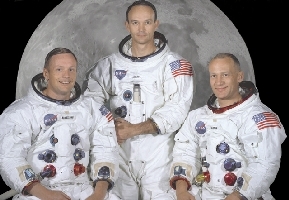 The crew of Apollo 11: Neil Armstrong, Michael Collins and Edwin Aldrin. The Americans will have to wait until 1966 and the Surveyor and Lunar Orbiter missions to lay their first satellites on the Moon and map its surface. These missions were to be used to prepare future Apollo landing sites. To succeed in this challenge, NASA engineers had to use the largest and heaviest rocket ever built, a colossus measuring 121 m in height and the tanks of which occupied most of the 5 floors available. As the floors emptied their fuel, they were abandoned in space to lighten the rocket. The fuel that propels a rocket must be very powerful because it must allow the rocket to free itself from the earth’s attraction to prevent it from falling back on Earth during flight. In addition, the rocket must be able to propel the ship without interruption during the 4 days that the flight lasts until the lunar orbit. After some rough launches where the rockets exploded either on the ground or during take-off and an accident that cost the lives of 3 astronauts who died burnt alive in the capsule, in 1968 NASA sent Apollo 8 missions and Apollo 10 photograph one last time the lunar surface before landing men, to find a site of landing little hurt not to risk the life of the crew. It was on the night of July 20-21, 1969 that the lunar module Eagle (LEM) of Apollo 11 landed on the Moon. A few hours later, Neil Armstrong and Buzz Aldrin walked the Moon while Michael Collins remained in orbit in the control module, waiting for the return of his teammates. Moonlighting Neil Armstrong pronounced this famous phrase: “It is a small step for man, a giant step for mankind.” 2h21m later they returned in the capsule bringing in their luggage hundreds of photographs and 21.7 kg of lunar stones. Previous post What is Light?